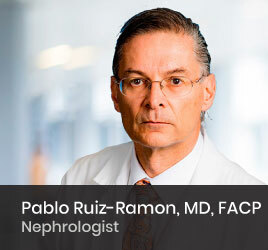 Dr. Ruiz-Ramon practiced Nephrology and Transplantation in Northern California for ten years, serving as the director of the Northern California Renal Transplant Center, before being recruited to the Tampa Bay Area in 2001 by the LifeLink Transplant Institute. He is well known for book chapters which he authored about Hypertension and Renal Transplantation and has been published in a number of well-known medical journals. He has also taught Nephrology to Residents and Fellows in training. Prior to joining Florida Kidney Physicians, he was the founder of Tampa Renal Physicians in 2005. He serves as the medical director of Fresenius North Tampa Dialysis Unit.